The Farr 40 class is still going strong, and was a decade after the boat's debut as evidenced by close racing at the 2008 Rolex North American Championship. Creating a successful one-design class is extremely challenging. It requires a unique mixture of design foresight with highly detailed and consistent construction techniques and strong fleet support. Bruce Farr, whose designs continue to dominate offshore racing, provides the foresight with another high-powered design targeted for talented amateur drivers. Like the Mumm 30 class, the Farr 40 must be skippered by Group 1 (nonprofessional) sailors and there are restrictions on the number of pros allowed in the crew. Free of running backstays, overlapping headsails and expensive crews, the Farr 40 offers sailboat owners exhilarating performance and the opportunity to compete in international regattas in an easy-to-handle and relatively affordable package. In some ways, the Farr 40, with its wide, flat deck and high-stability deep keel, is an easier boat to sail than a typical PHRF racer-cruiser. Carroll Marine is responsible for the consistent, high-tech construction that successful one-designs demand. The hull is constructed with E-glass fibers, epoxy with foam composites and wet prepreg fabrics. The entire hull and deck are post-cured, meaning they are literally baked in an oven. The result is an incredibly strong, light hull. The iron keel, which weighs 5,079 pounds for a 47-percent ballast-to-displacement ratio, has a large bulb on the bottom and a loaded draft of 8 feet, 6 inches. The rudder stock is carbon fiber, a material that IÕm not convinced is the best for the purpose, and the rudder blade is a combination of epoxy, carbon fiber and E-glass. Although the Farr 40 has a simple, workmanlike design philosophy, the overall level of finish is superb. A management group consisting of representatives of Farr International, Bruce Farr and Associates and Carroll Marine Ltd. is responsible for establishing and maintaining the strict class rules. The objectives of the class are to keep the boats as nearly identical as possible, while maintaining enough flexibility to race competitively under other international handicap rules, particularly the IMS. The highly detailed rules specify everything about the boats, from headliner scantlings to how many spare flashlight batteries can be carried. In the future, the Farr 40 Owners Association will be a partner in all class decisions. We test-sailed hull No. 8 on a lovely autumn afternoon on Chesapeake Bay. As our photo boat made radio contact, I took a moment to take a good look at the Farr 40 gliding along off the wind. In keeping with todayÕs formula for what makes boats go fast, the bow is virtually plumb; in fact, from some angles, it appeared that Farr used a ruler to draw the bow shape. Indeed, straight is the operative word. From the sheerline, to the reverse transom, to the wedge-shaped deckhouse, the 40 consists of straight lines and right angles. I joined the crew in the cockpit and immediately found myself behind the helm bringing the boat hard on the wind. Although the breeze was a light 7 to 8 knots, we quickly accelerated and attained a boat speed of 7 knots. The large, open cockpit is perfect for efficient sail handling but I wondered what it would be like in wild, offshore conditions. Although the huge, scooped-out wheel (which is optional) is well aft, all the sail controls are amidships. It is vital to keep the weight out of the ends and Farr has effectively centered the crew weight-virtually every line is led to this control point. The European-style mainsheet is aft and led below deck, and the traveler has internal tackle. The standard winches are Harkens, with 48.3As (three-speed) for the primaries and 44.2 STAs for the mainsheet and halyards. The mast-with double, swept-back spreaders-is carbon fiber, built by Sparcraft. Although fractionally rigged with discontinuous rod, masthead spinnakers are an optional part of the sail plan. The mast is stepped on the keel, running through the deck in an integrally molded collar, and a hydraulic mast jack is standard. Harken spinnaker gear is standard with a carbon fiber pole. The Sparcraft boom is aluminum. A Tuff Luff headstay system is also part of the standard package. When competing in class, the sail inventory will likely consist of one main, three jibs, three fractional spinnakers, a heavy-weather jib and one storm trysail. The loose-footed main has a top full batten and so do the jibs, which also carry short leach battens. I found myself mesmerized by the easy motion and effortless acceleration as we tacked and headed across the bay. The steering was precise and, until I found the groove, I tended to oversteer. By the time we tossed up the symmetrical, fractional chute, however, I had the boat moving well and was reacting to each lift. On a moderate reach in less than 10 knots true, we touched 8 knots several times. It was truly exciting to sail a boat that seemed to want to lift right out of the water. It was deceptively easy. Just when I started feeling like a hot shot, Geoff Stagg, president of Farr International, told me that he had flirted with 20 knots while screaming before the wind in a recent race. For someone who has spent the better part of his life satisfied with 6 knots, I could only imagine what that felt like. Reluctantly, I gave up the wheel and made a survey of the boat. Moving about the deck, I wondered if the weight of an extra handhold would slow the boat down. The nonskid surface, however, is aggressive and the wide-open deck plan does make going forward quick and easy. Dropping below, it doesn't take long to get the feel of the interior-there isn't much of one. Forward is sail stowage and the head. A tiny galley is on the bulkhead to port with a two-burner stove and a small sink. An icebox is opposite and there are two water tanks with 21 gallons each. Continuing aft, there are nice, long crew berths to port and starboard and several useful storage bins as well. The nav station is aft amidships, directly underneath the cockpit. Although the chart table is good-sized, it would definitely help to have a very short navigator; there is not even sitting headroom. The 27-horsepower Yanmar diesel is just forward of the nav station, almost directly centered in the boat. The Yanmar is actually facing aft. If this was a standard engine, it would need a V-drive transmission. But with a saildrive unit it doesnÕt matter which way the engine faces. There is terrific access to all sides of the engine. The fuel tank carries 20 gallons. When we finally did power up, there was some vibration-the lower unit seemed a little out of alignment. The roster of owners of the new Farr 40 One Design demonstrates the widespread popularity of the boat. Owners are from Sweden, Japan, Brazil and both coasts of the United States. 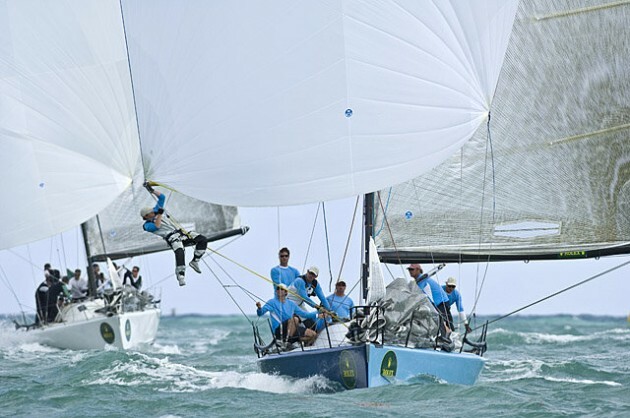 Although $235,000 may seem like a lot of money for a 40-foot boat, to sailors used to spending the megabucks required for big-time international racing, the simplicity and affordability of top-level one-design racing is very alluring indeed. In fact, one devoted Farr 40 owner from Sweden bought two boats, one to compete in Europe and one to race on this side of the Atlantic. He still contends that he is money ahead.